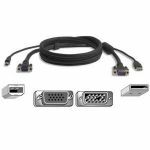 Belkin's Secure KVM products are TAA-compliant and have been validated to EAL 4+ security rating by the National Information Assurance Partnership (NIAP), which is administered by the National Security Agency (NSA). They are the optimal solution for government agencies looking for solutions that integrate legacy systems with new workstation deployments. 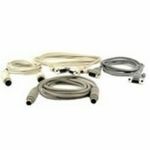 Belkin offers a variety of Smart Cables that are fully compatible with Belkin KVMs and are designed specifically for multi-platform workstation environments.